The Local Landcare Coordinators Initiative (LLCI) is a $15 million, four year project to renew the government - community relationship and unlock the full potential of the thousands of volunteers in the Landcare Network. 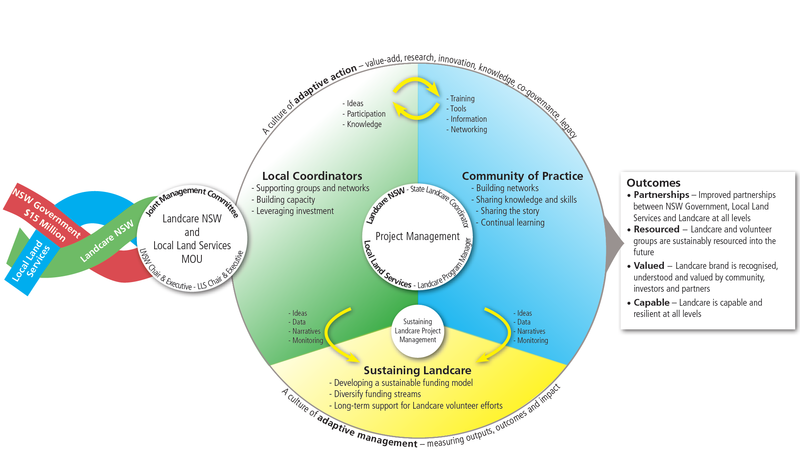 "Landcare NSW and Local Land Services as a government and community partnership are stronger together in achieving outcomes for communities and landscapes"
The LLCI reflects this partnership sentiment. It has been designed to put resources back into Landcare where it has been called for - it will put landcare in NSW on a more sustainable footing, with the majority of the funds going to community-based local coordinator positions. The 2015-2019 LLCI is significant in both its commitment of funds and also in its joint management approach. It will be collaboratively managed by Landcare NSW and the NSW Government, through Local Land Services. Sustaining Landcare; a program to build a sustainable financial footing for Landcare into the future. It is a new commitment to support regional Landcare Networks and local groups and will not be allocated for on-ground works. The initiation of a state wide Landcare insurance program. Leadership of the program at a state level is shared between the NSW State Landcare Coordinator (Landcare NSW) and the NSW Landcare Program Manager (Local Land Services). Working together, these roles are linking their organisations and building on the capacity of each.